... and chendol, for the matter. Melaka is a convenient for short getaway for Singaporeans. I was there for a short break recently. It is a haven for Nonya food but I did not have any of the usual dishes. 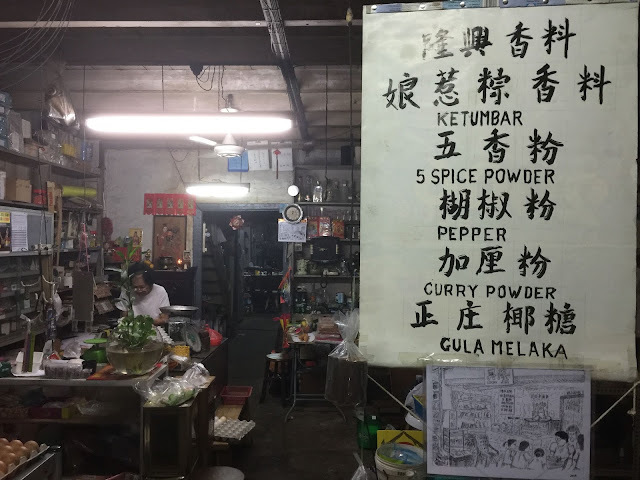 The typical Nonya restaurants in Melaka can be pretty average as modern chefs go for convenience rather than excellence. There are some very good ones but you often need to book in advance. When it comes to Nonya, I grew up eating them, and as a grown up, cooking them. My Mum learned a lot from my step-grandmother who was a very good Nonya cook. Come to think of it, my step grandma was always dressed in her sarong kebaya. No wonder. Our daughters always said that Nonya restaurant dishes "taste like home." My cooking has inescapable Nonya roots. This may explain why we do not always make a beeline for Nonya restaurants as we seldom eat what we can cook at home. 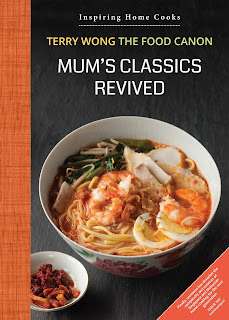 There are some good Nonya recipes here on this blog. But as I said, Melaka is more than just these. I draw your attention to some eateries which we will definitely come back to on our next visit. 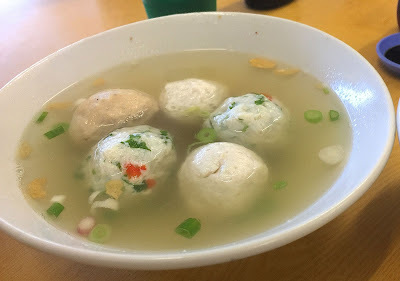 Home-made "Saitou", "Parang"or wolf herring fish balls is for many, the best fishballs you can have. I have tried making them myself and I must say that deboning the fish can be a real pain. And you have to "slap" it to get the bouncy texture. We stumbled across this stall at Kopitian Tanka along Jalan Kota Laksamana. I "eyeball-ed" and I could tell that it was worth a try and am glad that we did. 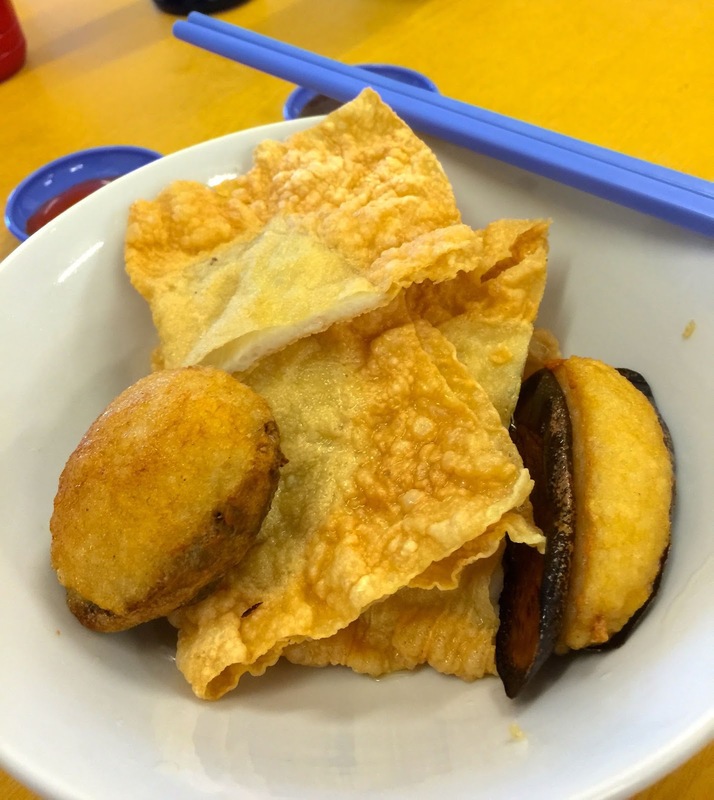 Unlike Hakka Yong Tofu, this Teochew version uses only fish and there is no pork in it. According to the owner (one of the two Tan brothers), the meat of the fish is separated using special equipment but when it comes to getting the bouncy texture, slapping by hand is still needed. We like the taste and bouncy/springy bite(how do one describe the texture of good fishballs?) of the fishballs. The stuffed beancurd and brinjal are fried on the spot when you order it. It is all thumbs up for their version of "home-made" YTF. Apparently, they serve a good herbal tea too, which we did not get to try. It is located quite near the historic area (Jonker street) and I have their details at the end of this post. 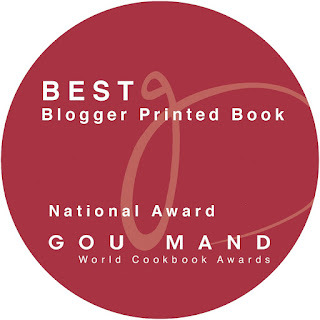 You can read a more detailed review here. The cafe culture has come to Melaka too. A cafe-hopping trip in this historic city a truly unique experience. 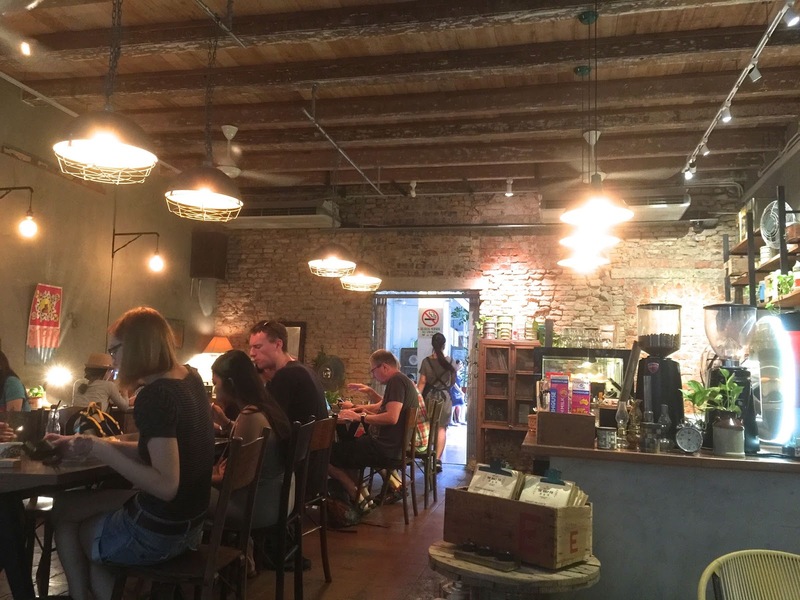 Given the number of old shophouses and heritage buildings in this historic city, I can imagine that you can find many eclectic indie cafes here. Indeed if you walk around the Jonker Street area (i.e the roads adjacent to it), you will come across some unusual, many which are inconspicuous and do not have clear signboards. We enjoyed the atmosphere at The Daily Fix. 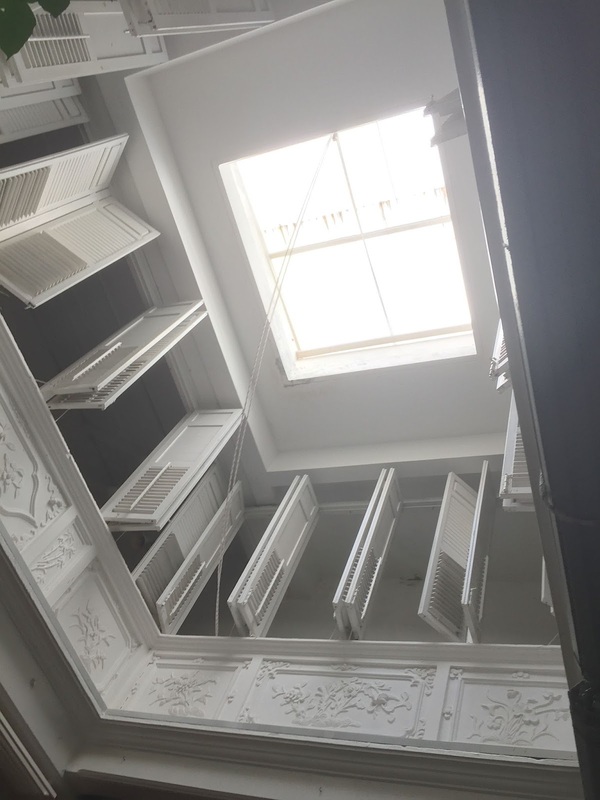 You are transported back in time in this shop house which was built in the 1800s. The decor and antique furnishing is beautiful and you will find yourself busy with your camera in here. Hidden behind a retail shop, it is not easy to find this cafe. 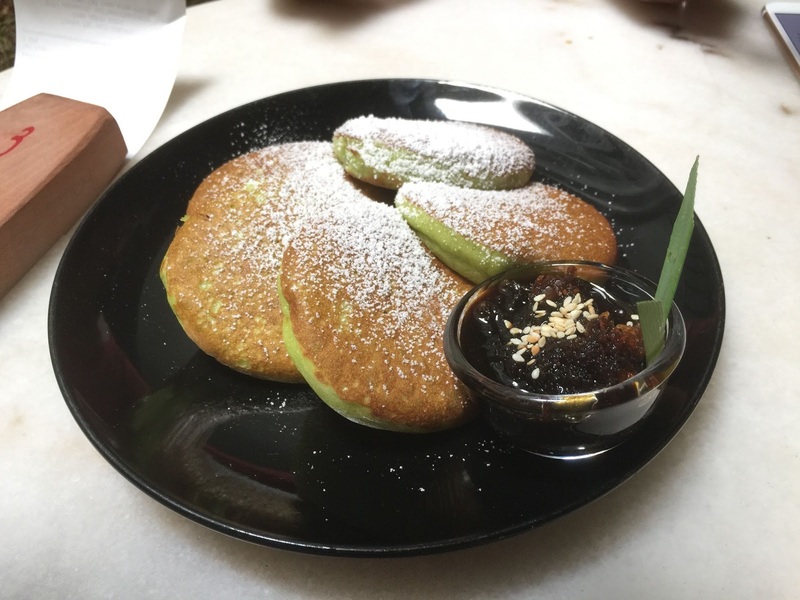 We love the Pandan pancake served with toasted coconut in Gula Melaka (lead photo). 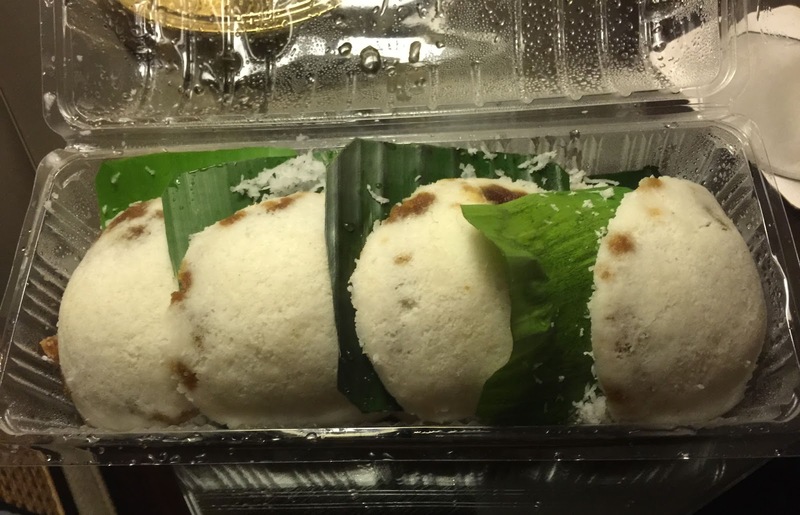 The "gula-kelapa" combination is common in traditional Nonya Kuehs and this dessert has notes of Pulut Into and Putu Piring. 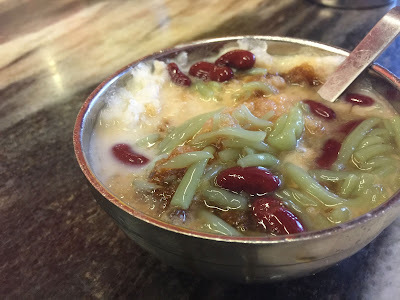 I am sure that as you move around the cafes here, you will find pandanus leaves, gula melaka and coconut used liberally to localised international-known recipes. Drop by The Daily Fix. But do get round to the other cafes too. That said, no trips to Melaka should end without a bowl of local chendol here. You can find Nonya, Indian (spices added) and Malay versions here. 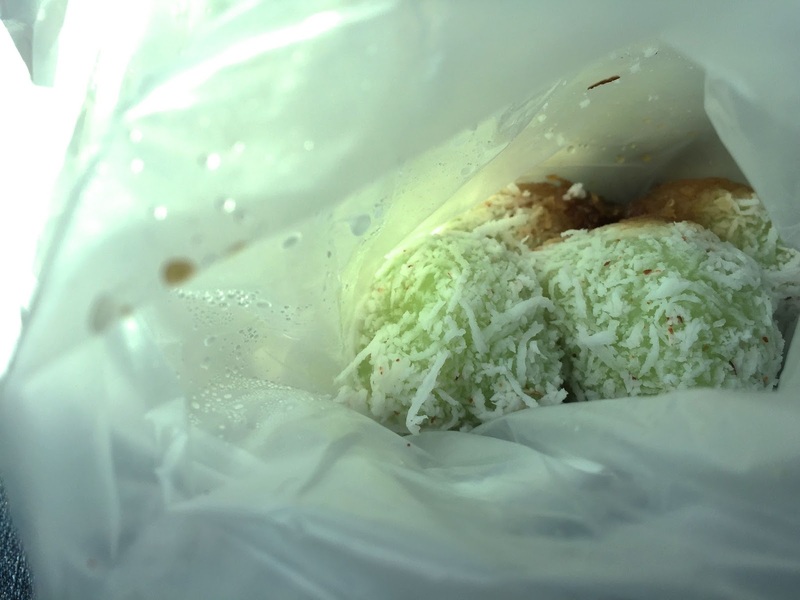 I am sure you like Ondeh Ondeh and you can get some freshly Baba-made ones from Kedai Aku dan Dia. They make it on the spot and it runs out very fast. There is a detailed description this shop here. My wife loves Putu Piring and so it was mandatory to buy some from Putu Piring Tengkera. 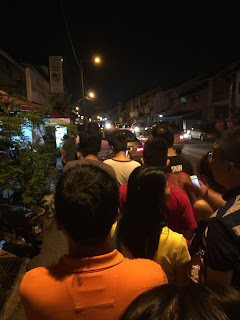 I never had to queue for Putu Piring before and so, the long roadside queue came as a surprise. And who could resist a queue? The putu here is large and chunky. We wished they used pure Gula Melaka though but it was easily the best putu we had come across. Old provision shophouses also dot the city and if you are a cook, don't forget to visit some. You can buy spices and food stuff very cheaply, especially when you consider how much they cost in Singapore. I am sure there is much to be discovered in this charming old city. We will be back. Kopitiam Tanka opens daily from 12.00 pm to 1.00 am at No. 5, Jalan Kota Laksamana, Taman Kota Laksamana Seksyen 1, 75250 Melaka. Tan Kar Pin could be reached at 016-6633040 or 016-6633004. 55, Jalan Hang Jebat (Jonker Street), 75200 Melaka.